A new report recommends returning artifacts seized from French colonies in Africa. Cambodia should also be included. The debate as to whether international museums and governments should return cultural artifacts acquired during the colonial period is not a new one. However, it has now been re-energized by French President Emmanuel Macron’s decision that France will return 26 cultural artifacts to Benin. The announcement follows the release of a presidential-commissioned report by French art historian Bénédicte Savoy and Senegalese economist Felwine Sarr, calling for thousands of African cultural artifacts taken during the colonial period to be returned to their respective countries, if requested. Although the report is only limited to Africa, as a former French colony, Cambodia should demand the repatriations of its cultural artifacts as well. The report could have far-reaching repercussions for international museum housing cultural artifacts taken during the colonial period, and for the colonialized countries wanting their cultural heritage back. With around 90 to 95 percent of Africa’s cultural heritage outside the continent in major museums, the report seeks to rebalance the access former colonized countries have to their own cultural heritage. The report recommends the restitution of “any objects taken by force or presumed to be acquired through inequitable conditions” by the army, scientific explorers, or colonial administrators from the late 19th century until 1960. Like Benin, Cambodia was also a part of the French Colonial Empire, having joined as a French protectorate in 1863 under the reign of King Norodom. Until the 15th century, Cambodia was a strong regional power; however, by the late 18th century it faced extinction as a sovereign state threatened by both Siam (modern Thailand) and Vietnam. Although the protectorate status ensured Cambodia’s territorial integrity remained intact against its neighbors, France largely controlled Cambodia’s internal and external affairs as a result. Cambodia was designated as a colonie d’exploitation (colony of economic exploitation). The French were infatuated with the temples and ruins of the ancient Khmer Empire, and also sought to extend the boundaries of France’s national heritage, or patrimoine. The ancient monuments and artifacts brought back to France would be incorporated into France’s cultural and architectural legacy. Through persuasion, diplomacy, coercion, and deception, French explorers, administrators, scholars, and soldiers gained access to the temples and ruins and acquired numerous cultural artifacts from Angkor. 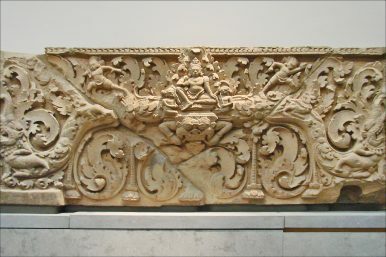 The first collection of Khmer artifacts was from the expeditions of French naval officer Louis Delaporte, who was inspired with the idea of “enriching our national museum with some of these artistic treasures.” With the approval and support of the French government, Delaporte led an expedition in 1873 with the aim of bringing back Khmer artifacts to be exhibited in France – some 70 statues were removed and taken. Featured at the 1878 l’Exposition Universelle, his collection later formed the Paris Musée Indochinois at the Palais de Trocadéro in 1882. Other French explorers continued the trend, such as Étienne Aymonier, who led three expeditions in Asia from 1882 to 1885. The collection grew with contributions from colonial administrators, such as the Résident supérieur du Cambodge (France’s official representative in Cambodia). Today, these collections can be found in the Guimet Museum in Paris. Although the UNESCO 1970 Convention sought to protect cultural property from being acquired illegitimately without proper documentation, Cambodia experienced widespread looting and destruction of its archaeological sites from 1970 to 1998, masked by civil war that nearly destroyed its cultural heritage. Many of the cultural artifacts that were smuggled out of the country were acquired by international collectors, museums, and auction house. With relative peace, security and development over the last two decades, the Cambodian government has had some success in the return of its cultural artifacts, such as the two Pandava brothers returned by the Metropolitan Museum of Art in New York after being absent for more than four decades. The return of these artifacts to Cambodia will be difficult given France’s adherence to the principle of the “inalienability” of public heritage, which is reinforced within French heritage laws. However, France already returned the head of 7th-century statue of a Hindu deity Harihara in 2016. The head was taken by French academics in 1882-83 and displayed at the Guimet Museum. This is a positive step forward in reconciliation. Nevertheless, a sizable collection of Khmer artifacts remains in France. Some argue the number of Khmer artifacts in France is greater than in the National Museum of Phnom Penh. Those who argue repatriation and restitution is impossible given French laws should remember laws can be change when there is an impetus to do so. As these pieces were taken more than a century ago, generations of Cambodians have not had the privilege to access those cultural artifacts in France, which is not only geographically far away, but also cost-prohibitive to visit for many, considering the cost of travel and entry into the museums. The long-term long agreements that are being offered instead of full repatriation are unacceptable; the only message that it conveys is how the state continues to uphold the legacies of its colonial past. With the recent direction of the French government, Cambodia must act swiftly and declare its interest in the repatriation its cultural artifacts. Working collectively with Vietnam and Laos would also help raise the case that French’s Indochina should be included in the discourse. The return of Cambodia’s cultural artifacts would reinforce the “unique and special” bilateral relationship between Cambodia and France and serve as a gesture of goodwill given the exploitation of Cambodia, culturally and economically, during the French colonial rule. Critics may argue that Cambodia is unprepared to receive its treasures. However, the National Museum in Phnom Penh is well-equipped in housing and caring for the cultural artifacts, having been trained and supported by international archaeologists, including those from France, who have long supported Cambodia in the preservation and conservation of its cultural heritage. The repatriation of several Cambodian cultural artifacts over the past years has allowed Cambodia to heal and restore a part of the Cambodian spirit and soul that had been lost following its traumatic history. The moral question is now before the French people: will they continue to uphold the legacies of colonialism in the 21st century, or will they choose the path of reconciliation with their former colonies? The answer seems easy in this day and age, but France must be ready to take responsibility for the injustices that took place under its colonial rule. Darren Touch is a Master of Public Policy and Global Affairs candidate at the University of British Columbia, and an active commentator on Southeast Asian affairs. He is also the former President of the Cambodian Association of the Ottawa Valley and former Associate Director, Corporate Communications and Operations of the Canadian Chamber of Commerce in Cambodia.